"I already won the price of most aggressive rider last year in stage 3 in London, it's quite funny. It wasn't exactly my goal at the start but I'm happy to be awarded." The third stage of the Tour de France today held again a number of challenges ready for the Peloton. On the section of 159 kilometers from Antwerp to Huy the first climbs of this year's Tour de France awaited the riders. 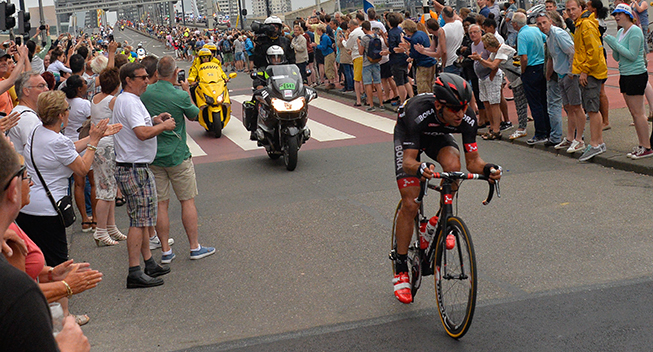 As yesterday Jan Barta attacked in the first kilometers and successfully made it into the group. The field granted the break-away group a lead of almost four minutes before it already came close with a few seconds just before the first climb. Shortly afterwards a big crash occured in which also riders of BORA - ARGON 18 were involved including the leader Dominik Nerz. The race was neutralized at this time. All riders of the team were able to continue the race, but had to go for a medical examination after the stage. Jose Mendes was diagnosed a bruised knee and Dominik Nerz a rib bruise. Both riders will start tomorrow. After the neutralisation the riders rode an attentive race despite the fall and brought Dominik Nerz to the finish line with a united team performance. Jan Barta has been awarded as the most active rider of the day with the red number. "I knew it would be very difficult to go for the stage victory because of the profile of the race at the end but I wanted to try because I like this kind of breakaways," Barta said. "I already tried yesterday and it didn't work out so I've wanted to try again. At least I made the decisive move, it was already a success. I already won the price of most aggressive rider last year in stage 3 in London, it's quite funny. It wasn't exactly my goal at the start but I'm happy to be awarded." "The stage started well. Jan again got the opportunity to go in the group and he managed it very well. After his crash in the time trial the red number is a great result for Jan. It was surprising that the race blew up already before the first mountain, so that the group was almost caught. "Shortly before the climb, three positions ahead of Dominik, the massive crash happened. In a situation like this as a rider you have no chance to escape. After that, the team rode a great race. With injuries like Dominik had, it is a strong performance, that he has lost only so little time. "To go on the cobblestone tomorrow with a rib bruise, of course, is anything but pleasant. The bad luck of the last days of course gives the riders a hard time - but we continue to fight, "said Enrico Poitschke, sports director of BORA - ARGON 18, the day.